Silvia is 5 feet exact, sporting a nice outfit that's flexible for running around and sleeping somewhere other then her home. It may be a bit revealing, but she doesn't mind. She has white skin and matching silver hair, along with red eyes. Her favorite weapon to use is her spears, which are rather short and metallic. They are very sturdy, and will carry at least two with her, weather it be to dual wield them or if she needs another one. 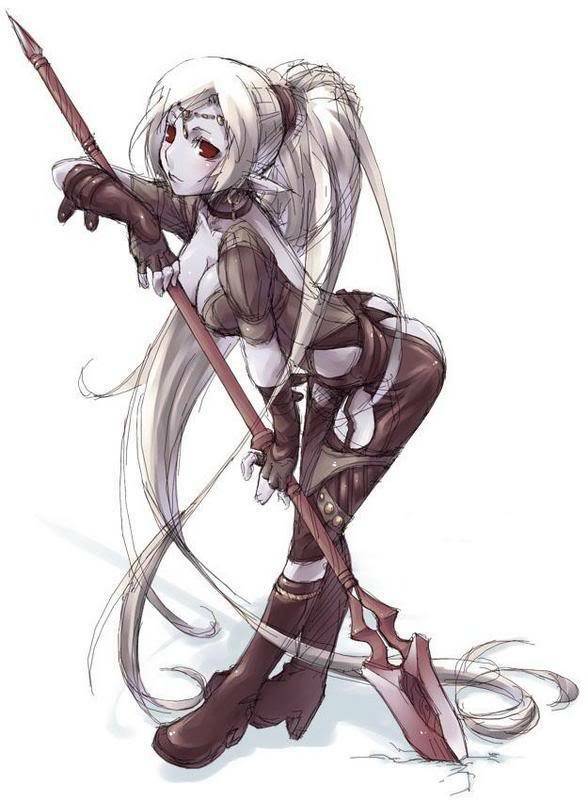 She will use long bows and short swords as well, but she often sticks to spears. Personality: Silvia, for living alone, is pretty talkative for the situation she lives in. She is more of a serious person, but can laugh and what not if the situation calls for it, and loves to train. She is also a craftsman, chef, baker, hunter, and black smith. She has all of these skills due to her being apart of multiple families that showed her how to do them. Silvia is not a believer of killing or war, though she enjoys fighting as a sport. As such, whenever she gets in a fight, she will usually strip her opponents. History: Silvia was born, and at the age of 4, was orphaned. After this, she spent most of her life going from family to family, never really fitting in. When she was 9, she was adopted by a family of drow mages, who taught her magic and changed her skin and hair. They later died trying to kill a group of human mages, and Silvia ran off to live in the forest. At this point, she was taught a good amount of skills to live on her own, and learned more later on. She doesn't consider herself a mage, as the only magic she knows is to change her physical feature. She lives in a cabin alone in the woods, but will go out to trade in cities. Silvia has a couple of pets. She has a noble black horse that she will use for transportation. She has a young griffon that's not very suitable for battle as of yet, but she doesn't mind. Finally, for battle, Silvia has a grizzly bear, which she will call if she needs brute force. With the bear, is also two cubs. The bear only allows Silvia near the cubs.